In the last years, the deer population has increased tremendously and some specialists even talk about a 20 million population of white tails all over the world. Nevertheless, deer have a great impact on vegetable gardens and landscape plants, in suburban areas where they don’t get enough food and there’s the need to keep the numbers down. An electric fence isn’t quite a complete physical barrier, but it gives an electric shock that makes the animals to avoid the fence. A fence like this is an unfamiliar object to a deer and it investigates it for the first time ever, it may touch it with its nose. If the deer gets enough of a shock the first time, chances are it’s not going to come back near it ever again. Going solar is always a good thing and getting a solar fence is even better, especially when you’re trying to cut down your spending. No only you’re not going to spend a lot on the batteries or electricity, but you’re doing a good thing to the environment too. Let’s not forget the part where you don’t need to check the fence very often to see how it’s doing nor making sure that it’s on or not. 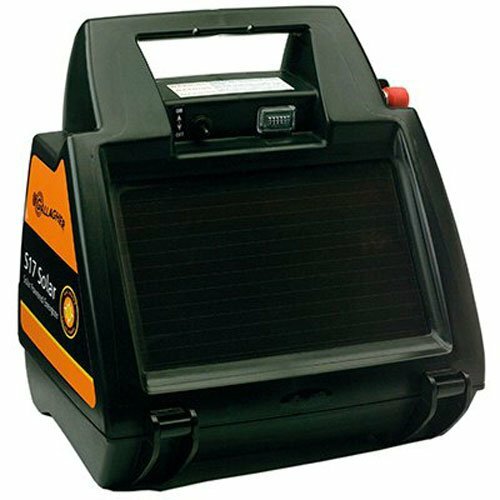 Just to play it on the safe side, there are few things to consider when shopping for a solar fence charger. For instance, you shouldn’t electrify a barb wire fence as it may injure and even kill the deer stuck in the fence. If there are bigger animals on your landscape, you need a thicker fence, therefore a bigger solar charger that is powerful enough for the big fence. The number of the animals on your property is also important and the more cows are touching, the higher the risks for the fence to lose its electricity. It’s important that you measure the size of the area you want to electrify so that the entire fence has just the right voltage. Typically, most solar electric fence kits tell you about the size of the field that you may use it for. You don’t want your fence to have weak spots, where the electricity is low to none. Don’t forget to clear vegetation away from the fence as they also make the battery drain if constantly touching the fence. The more you’re willing to pay for your solar charger, the more you may expect from it when it comes to efficiency and reliability. A good model works even on a cloudy day and keeps the batteries charged for a long time. Don’t forget to check its build either as you don’t want animals damage it the second you install it. Reliable and fairly priced, the Gallagher G344404 S17 6-volt Solar Fencer is an option to consider, especially if you’re going shopping on a fixed budget. The solar charger is powerful enough to power up to 10 acres/1 mile of multi-wire fence, storing an energy of maximum 0.17 Joules. Going over the details we notice the built-in solar panel that charges efficiently the built-in battery, even on a less sunny day. The battery holds its charge and you don’t need to check the charger all the time to see if it’s working or not. The setup is easy and the charger is easy to use and to take care of. The build is good and the charger has a durability feel to it. We really like a lot its portability as the charger has a compact shape and a sturdy handle for easier transportation. The charger is also very easy to pack, just in case you were wondering. The solid build and the fact you can rely on it for keeping deer away from your plantation, all wrapped up in a fairly low price, make the solar charger a wise buy for many. Easy to use and to carry around, the solar fence charger isn’t just a reliable option, but also quite a bang for your buck. Covering 10 acres under the right conditions, the Fi-Shock SS-440 Solar-Powered Low Impedance is a nice surprise that takes shorts even when in contact with weeds. The low-impedance technology on the fence means the battery doesn’t drain that fast and the solar panel powers up the battery efficiently. The design is well thought out and the solar panel comes in a damage-resistant compartment, for longer lifespan. 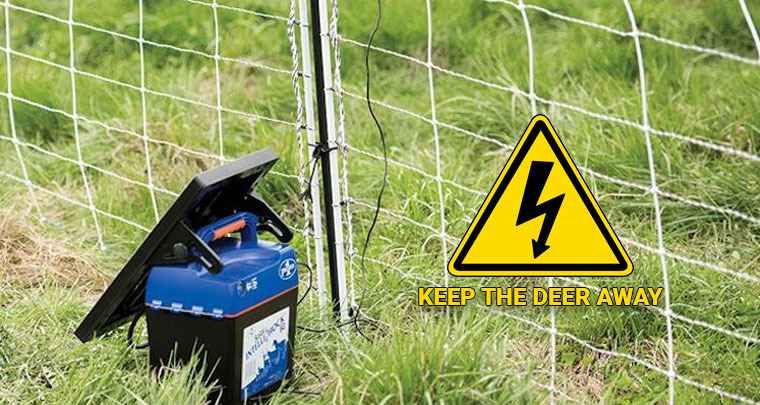 The charger is easy to install and it’s a great option for keeping livestock, deer included, away from your garden. The short pulse of electricity is safe and the animals learn by training not to touch anymore the fence. The versatility of the charger is important to mention and the charger works with any type of fence wire, polytape and poly wire included. The 6-volt gel cell battery is good and matches the fences’s circuitry and solar panel. It holds its charge even on a rainy day, but you need to charge it for 3 days for maximum battery life before you actually install it. The build is also to mention and the damage-resistant construction protects not only the solar panels, but the internal electrical components and internal batteries as well. Nevertheless, the solar fence charger checks all the boxes when it comes to reliability, efficiency and durability so it’s enough for most of us. 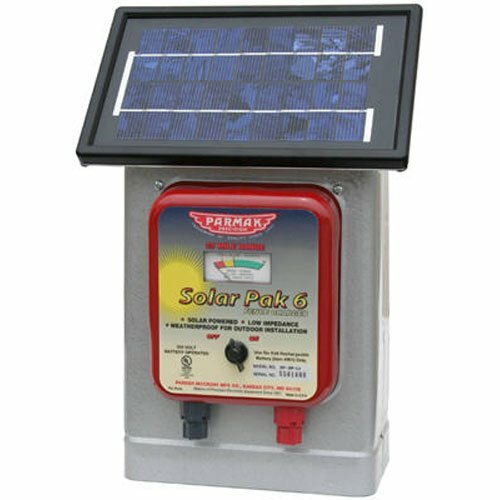 Reliable and quite surprising for the buck you’re paying for it, the Parmak DF-SP-LI Solar Pak 6 Low Impedance 6-Volt Battery-Operated 25-Mile-Range Electric Fence Charger is going to keep deer away from your garden as long as the fence is tall enough for the deer not to jump over it. The solar-powered electric fences is a low impedance type and comes with a built-in performance meter. It’s powerful enough to shock through wet weeds and brush, becoming an efficient tool for livestock control. The solar charger powers up to 25 miles of fence, using a 1.4 Joules solar/battery to operate. The solid state circuitry gives dependable, strong low impedance shock to end of fence. The solar panel is effective and provides more than 42% battery charging power. it’s strong enough to charge the battery even on a cloudy day, using free energy from the sun for the maximum shock. It may work for 21 days in complete darkness if the battery is fully charged. The build is good and the solar charge is weather proof, taking the use for a long time. In order to get the best results, it’s essential to install it right. Last, but not least, the solar charger is made here in the USA and this may seal the deal for many. All in all, the solar fence charger works for keeping deer and other animals at distance and you do get a great bargain for it too. 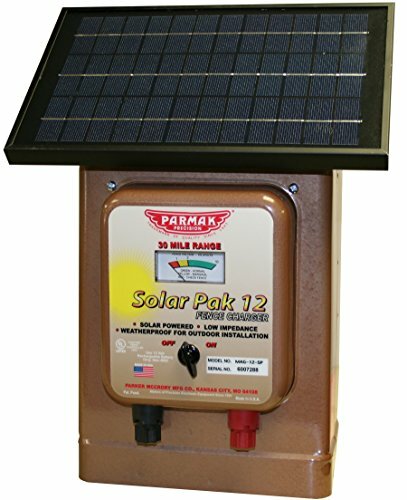 Even though you may be feeling like paying the extra buck for the Parmak Magnum Solar-Pak 12 Low Impedance, once you install it you get to realize that the solar fence charger is worth every single penny. The solar fence charger comes with a 12-volt rechargeable battery that charges throughout the day, by sunlight and powers efficiently the fencer at night. The low impedance gives maximum power and the battery is going to impress you with its long life span. The solar charger is powerful enough for charging up to 30 miles of fence -3.1+ joules. The construction is solid and the charger is weatherproof and made for the outdoor use. Its shape and design increase its portability and the charger is a reliable choice for the large pastures. Going through the list of features shows us the built-in performance meter. The setup and use are easy to do and the charger is efficient even on a cloudy day. The instructions are easy to follow and the charger is made to take a beat. 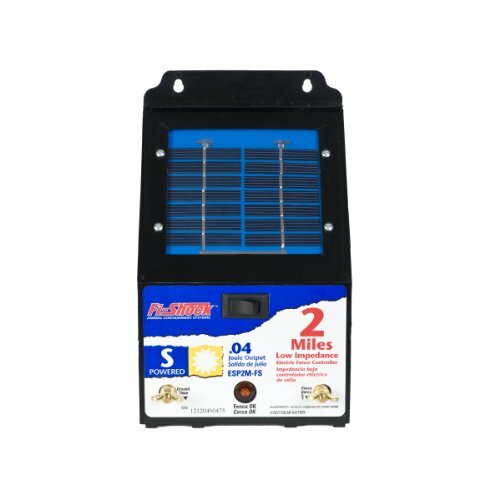 All in all, the solar fence charger keeps at distance deer and all sorts of animals and takes your mind away off the problem for many years to come. 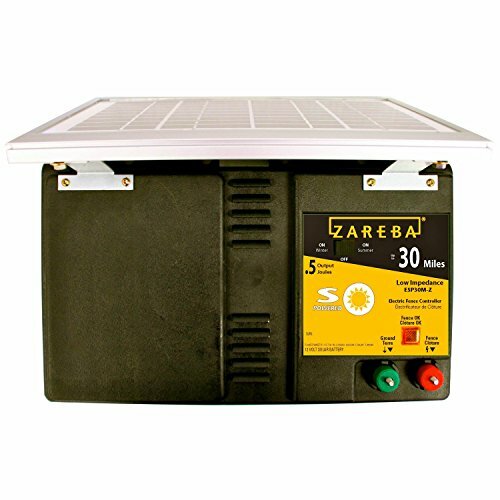 Offering a 30 mile-range and running for even 2 weeks with no sun, the Zareba ESP30M-Z Solar-Powered Low-Impedance is a great investment to make for the well-being of your plantation. The solar-powered fence charger is dependable and comes with many useful features. It presents an OK indicator light and color-coordinated terminals. It comes with two 6-volt batteries and uses low-impedance technology to give maximum energy level on your fence. The solar setting switch extends the life span of the battery and the flashing light lets you know when the charger is working. The versatility of the charger is another good thing to write down and you may use it for various fence types: steel/aluminum, poly tape, poly wire and poly rope. The construction adds up on the list of goods and we need to pinpoint the compartment damage-resistant build of the solar panels. Additionally, the charger is made in our USA and this may seal the deal for many. Not only the solar panel are damage-protected, but also the intuitive technology minimizes risks for shorts in case fence gets in contact with weeds. The charger works great and it’s build to take the use for a long time. Its warranty also includes damage caused by lighting. Regardless of the minor issues, the charger is reliable, efficient, powerful and durable. And let’s not forget is made in our USA!